This is the second of an intermittent series of articles on the future of the Sacramento-San Joaquin Delta. In any lowland, levees define how humans live and how they disrupt native habitats. This is as true for the Sacramento-San Joaquin Delta as it is for coastal Louisiana, Vietnam and the Netherlands. Flood safety in the Delta is a statewide concern because the region serves as a hub for delivering water to most Californians and supports native fish. Like many Dutch lowlands, the Delta became low from the conversion of tidal marsh to farmland. Once diked and drained, peat soils (accumulating over millennia with sea level rise) were exposed to air, decomposed and subsided. Dutch lowlands have sunk about 6 feet in 300 years, while some islands in the western and central Delta have subsided much more — up to about 25 feet over 150 years — because of California’s warmer and sunnier climate. 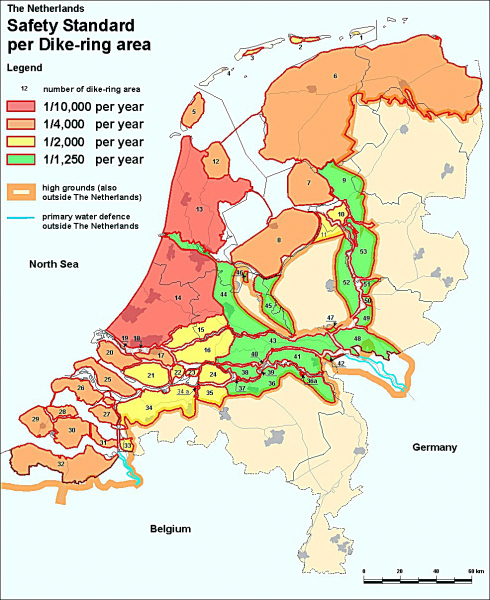 The Dutch have a long and distinguished record of managing floods in their lowlands. They have been reclaiming dry land from the sea and marshlands since the Middle Ages. They have suffered and learned from centuries of flooding. Local landowners did most of the land reclamation and paid for the work themselves. As the country grew, it consolidated the governance of reclamation from what were once thousands of local “water boards” to 24 regional boards, which maintain levees and dikes and treat wastewater. Consolidation and growing prosperity brought more state involvement and funding for flood protection, along with more formal state protection standards and prioritization. Investments in flood protection are now guided by formal analyses of risks, costs and benefits (van Dantzig 1956). The Dutch risk analysis has provided a rigorous, understandable and widely accepted basis for flood management decisions and investments for nearly 60 years (Eijgenraam et al 2014, Schweckendiek 2013). The level of flood protection is chosen to minimize the total costs of flood damage and protect investments. Having risk analysis drive the setting of flood safety standards and investment priorities follows a long Dutch tradition of improving analytical tools to solidify the scientific basis of decision-making (Disco and van der Ende 2003). The risk analysis has grown to include loss of life, longer planning horizons, sea level rise and more subtle aspects of levee system reliability – aspects that have led to better management of levees and floods (Eijgenraam et al. 2014, Jonkman et al 2011; Schweckendiek 2013). The Dutch sometimes have retreated from the sea following catastrophic storms, or by design to increase flood conveyance capacity, restore natural areas and reduce costs. The Netherlands has setback some levees, widened some channels and “de-poldered” or abandoned some subsided land under its “Room for the River” program (van Staveren et al. 2014). For the Delta, state levee decisions are probably the single most important and defining policy area. Living in the Delta and in lowlands elsewhere in the world is largely defined by the design and maintenance of levee systems and the prioritization of levee projects. The flow and mixing of water is shaped by the configuration and reliability of levee systems and how they fail. (In any system, levees will fail, and part of levee policy is what to do when they fail.) Levee systems also shape the remaining natural habitat for native species and other important habitat, such as the Delta’s famous bass fishery. Where levee system design is so fundamentally important to so many interests, it is tempting to perform highly complex analysis of many alternative management strategies for each of the many social, economic and environmental interests in the region. However, thoughtful analysts and policymakers know such analyses can do more to confuse than enlighten. Define problems in ways they can be solved. The Dutch have defined their levee problem in a way that can be usefully solved, even if the definition is necessarily incomplete. Indecision or perpetuation of a deteriorating status quo is dangerous in lowlands. 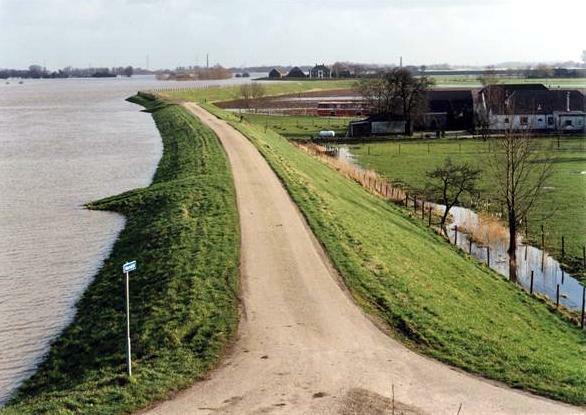 The Dutch begin by examining the economic benefits, costs and risks in levee system design. Economic sustainability and public safety are the major objectives for levees below sea level. Additional social and environmental concerns are considered separately. This process clarifies trade-offs and avoids more complex approaches that tend to add more confusion than insight. Base levee standards and safety levels mainly on risk analysis. Economically and environmentally, some areas merit higher levels of flood protection than others. Some areas may deserve no flood protection at all. In other cases, flooding may benefit the environment. Consolidate levee districts. Most levee maintenance is a local responsibility that is funded and inspected by the state. Long-term consolidation has resulted in more responsible use of state funds and better flood protection for more land. California’s Delta has many unique challenges (Finch 1985; Lund et al 2010; Lund 2011), but much can be learned from the efforts and successes in the Netherlands (Woodall and Lund 2009; Ertsen and Lund 2011). If we want to solve hard problems, we must define and organize them in ways that can be solved, even imperfectly. Indecision risks everything in lowlands – local lives and livelihoods, a water system serving millions of Californians and acres of farmland, and important habitat for native aquatic species. Nostalgia for the Delta of the 1950’s or 1850’s cannot prevail for long over the hard physics and economics of lowland risks. California has a long tradition of improperly naming physical features in the Sacramento-San Joaquin Delta, beginning with the term delta. Throughout the rest of the world (with the exception of the Okavango Delta), deltas are formed where rivers disgorge into open bodies of water, leaving a prism of sediment shaped like the Greek letter Δ (delta). The Sacramento-San Joaquin “Delta” does not qualify as a traditional delta since it is formed at the tidally influenced confluence of two large floodplain rivers, which was submerged more than 6,000 years ago by sea level rise. Other common misnomers are levees and islands. Levees are earthen embankments that hold back water during floods. The Delta “levees” are actually dikes because they hold back water all the time. Islands are lands of positive relief surrounded by water. The Delta’s “islands” are reclaimed lands that form topographic depressions surrounded by water. In this regard, they are polders, not islands. The Dutch, who have many dikes maintaining polders in their delta landscape, go by more authoritative terminology. Finch, M. (1985), “Earthquake Damage in the Sacramento-San Joaquin Delta, Sacramento and San Joaquin Counties,” California Geology. This entry was posted in Sacramento-San Joaquin Delta and tagged Dutch, Jay Lund, levee, Sacramento-San Joaquin Delta. Bookmark the permalink.